This "Retirement Planning" site is dedicated to providing comprehensive and helpful information for those planning for or currently enjoying retirement. The book review section is targeted towards that end. 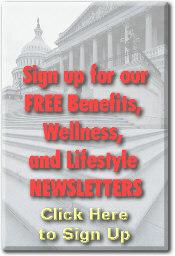 We will review books and courses that we find helpful and informative for our readers and site visitors. The subjects will include finance, investing, health and exercise, cooking, lifestyle, and everything in between that may be of interest to YOU. If you find a recent book that you have read helpful let us know and we will review it here. We also are looking for book reviewers. There is considerably more to retirement than meets the eye and this site will help you focus on the critical issues that we all must address at this time in our lives. If you would like to contribute reviews to our site please send a short bio and a color photo (jpeg or gif format) if available including your federal service time to the attention of Dennis Damp (ddamp@federalretirement.net). Also send us the types of books that you would prefer to review. We will assign reviews to volunteers as titles are received from publishers. Reviewers will receive full credit for all contributions. Bookhaven reserves the right to reject any submissions that we feel inappropriate and to edit all copy received prior to posting. Note: This course can help those approaching retirement and retirees negotiate everything from a new car to a new home or to purchase a vacation home to get away from it all. For those approaching retirement it can help you make a difference at work and earn promotions that will increase your high three years average earnings thereby increasing your annuity in retirement. This course is also good for anyone who wishes to keep working after retirement as a consultant, contractor, or small business owner. The more tools you have at your disposal the more successful you will be. Dennis V. Damp Sr.
“Influence: Mastering Life’s Most Powerful Skill” Is an audio CD or DVD-ROM course including 12 lectures on several discs. This course, one of The Great Courses series, is led by Kenneth G. Brown, Ph. D., SPHR Professor of Management and Organizations at the University of Iowa. Kenneth Brown speaks and leads the courses in a straightforward and easy to understand manner. He talks not only about studies involving influence, but also how to apply influence techniques in real world situations. Some real world applications of influence involve interviewing for jobs, managing employees, or even negotiating a large dollar purchase such as a car. The major theme of the audio course involves a model of influence to help understand the different components of the course. The ATTiC model is an acronym for the major items that make up influence and how it should be applied in many situations. ATTiC stands for agent, target, tactics, and the context of influence. The influence agent can either give or receive influence whether the influence is good or bad. The target typically receives the influence and the lecture talks about identifying targets and how to use the proper tactics to influence that target. There are also many context components of how to influence as well including whether to use hard or soft influence tactics and how to apply the technique in the proper situations. This course covers many studies and examples given throughout the lecture. Kenneth Brown references many studies performed at Universities and in real world situations using test groups and certain control group situations. The studies helped to give more credence to certain interview tactics, context, and targets of influence. He talks in depth about the controls of the influence experiments and how individuals reacted when some controls were changed within the experiment. For example, one of the studies measured reactions of influence targets for waiters and waitresses to get better tips. While most of the suggestions seem to be common sense, others can be surprising. Simple things like smiles and using the customer’s name created better influence for tips. While other items including kneeling down to talk to the customer also created favorable results. This program also covers when to use hard and soft tactics to influence a person, group, or situation. Several studies and examples are given as to which tactics work better in certain situations. If you are a manger of employees, this section would probably be very helpful as it gives a good perspective of how to use these tactics in specific work environment situations. Are you in need to motivate or influence employees? Learn how to make a task a priority or possibly have employees work late to get the extra work done. 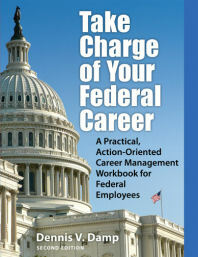 Also learn more about when to motivate with recognition, inspiration, social consciousness, or more rigid hard tactics. Some hard tactics may include when to use more aggressive voice tones or knowing when you may need to use power as an influence tactic. While this program delves into mostly positive influence tactics, there is a section dedicated to recognizing non ethical tactics that salesman or managers may use to abuse their influence power. It was good to hear about these non-ethical behaviors to be able to recognize them in real life situations. There are also sections of this course dedicated to delivering effective speeches along with developing your negotiation skills. Many managers and students who are in need of developing effective speech skills may be drawn to a program like this one. Learn about the tactics and best practices for speaking engagements as well. Develop negotiation skills needed not only in the workplace, but in everyday life. While many of the negotiation tactics seem like common sense, there are many studies and real life applications that may give you further ideas and strategies. In closing, I would highly recommend this program on influence to managers, employees, or anyone in need of updating their influence skills. This audio conference offers may tips on influence tactics, negotiating skills, and giving effective speeches. The program covers numerous University studies based on real world applications of influence experiments. Whether you are looking to negotiate a lower price on your next vehicle, prepare for that next presentation to management, or inspire your workforce, this program offers the tips you will need to successfully accomplish your goals. Retiring soon and discussing or giving thought to relocating? This is a good source for seriously exploring locations and what you need to consider in making the decision. 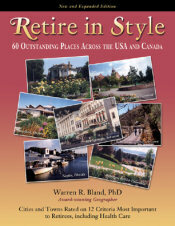 The book covers 60 top retirement locations and includes all regions of the United States and areas of Canada. The author, Warren Bland, PhD, gives graphic explanations of all the things you would consider in comparing areas you may want to retire to. The ratings cover landscape of the community and its overall appearance, quality of life, cost of living, transportation, retail services, health care, community services, cultural activities, recreational activities, work/volunteer activities, and crime. He also provides month-by-month climate information and averages for sun, rain and snow. To his credit, he also introduces his book with a segment titled Making the Decision to Relocate. Take time to give thought to some of the points he makes. It will help you with the difficult decision of leaving your community to relocate to an area that you believe better suits your interests for your retirement. Keep in mind this book contains information that is dated but the data is still valid for comparing and identifying which communities will provide services and entertainment you are most interested in. You will need to determine where the current real estate market is by contacting a local agent. You may be pleasantly surprised in the current housing market! I used this book to research our vacation home search in central east coast locations. I found it very informative and it gave my wife and I a good perspective of what to expect. We are looking for a home-away-from-home to escape to for the winter months. We live in Pennsylvania and thought that a second home in possibly North Carolina or Southern Virginia would be close enough to make the trip in one day with no more than an 8 hour drive. At first we included Florida but later decided it would be best to not be more than a day away from our primary residence. We don't like extended car trips and if our second home is too far away we wouldn't make the trip as frequently as we would like. "Retire in Style" was very helpful in our research. At the start of the year, I typically spend a week or so evaluating investments and balancing my accounts. I also search for new investment opportunities, primarily scouring financial data from a wealth of resources looking for undervalued stocks and mutual funds. Throughout the year I spend most Sunday mornings reviewing investments. Yes, it takes a lot of time and research to actively manage investments, especially when you invest in individual stocks, bonds, and mutual funds. Just imagine how expensive it is for large actively managed mutual funds to keep on top of their investments, buy and sell equities and bonds, and maintain large research staffs to assist the highly paid fund managers! There is an easier way, and for many reading this column, the only way to safely invest and not pour your heart and soul into the process and that WAY is through Index and Exchange Traded Funds (ETFs). With Index Funds you will closely match the performance of major stock indexes like the S&P 500, the Dow Jones Wilshire 5000 Composite Index or any one of a thousand other index funds that track everything from international stocks and bonds to you name it. This excellent resource gives you the scoop on these lucrative low cost investments and explains why you too should be in index funds rather than chasing the top performing high cost equity mutual funds. The beauty of Index funds is that you don’t have to be all that knowledgeable about markets or investment lingo. All you need to know is included in this book and you can get started with a safe, low cost, high performing index fund mix quickly using their recommended "Life-Cycle Index Fund Models" presented in Chapter 15. They have model index fund portfolios for "Early Savers" ages 20 to 39, "Mid-Life Accumulators" ages 40 to 59 and for "Pre-retirees and Active Retirees" ages 60 to 79. 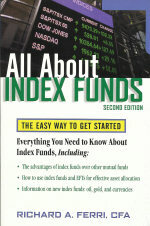 Chapter 4 states that, "Exchange Traded Funds (ETFs) are Index Funds that trade like stocks." Unlike Index Funds you incur additional expenses such as commissions and trading spreads. Investors like the fact that index ETFs trade like stocks and most new index funds are now being introduced through ETFs. I personally like the simpler Index Funds however ETFs do have tax and other advantages that investors can take advantage of. This book provides a comprehensive overview including their history, advantages, and disadvantages. If you are apprehensive about investing, and most are, this is the one of the safest ways to achieve high returns with minimal risk. When I say high returns I’m talking about percentage gains on target with the market averages for a year. For example, the Fidelity Spartan Total Market Index Fund’s (FSTMX) most recent one year return was 14.6% with an average return of 8.1% over the past 5 years. That is more than double the average return that you would have made in Certificates of Deposit, Money Market Accounts, or Savings Bonds during that same period and the management fee for this fund is only .10%. Compare that management fee to the average stock mutual fund management fee of 1.5% plus sales commissions (loads) that many managed mutual funds charge. The Fidelity Spartan Total Market Index Fund tracks the Dow Jones Wilshire 5000 Composite Index, a broad market index that offers returns that are very close to the overall domestic stock market return each year. The model portfolios diversify the risk even more by adding index or ETF funds for international stocks, and fixed income including inflation protection investments. Overall I rate All About Index funds a buy for a number of reasons. First, it is thorough and comprehensive. You don’t have to read every chapter, only the ones that tickle your fancy. You will learn about Index funds, ETFs, indexes opposed to markets, tax advantages, managing your funds, sample portfolios, and much more. A valuable reference for those who have felt left out of the investment arena and want to grow their nest egg without the burdens and worry that actively managed accounts require. If you live on the East coast or plan a visit this book is a wealth of information for anyone traveling from Boston to Florida and back. Full of valuable and helpful information for each exit along the way. You will find everything from mileage charts, rest stops, attractions, restaurants, hotel and motel chain toll free numbers, local radio stations identified by genre, campgrounds, auto mechanic listings, golf courses, including journal pages and expense charts. What really pulls this all together are the state-by-state and exit-by-exit summaries that include historical references, local lure, museums, shopping, recommended B & B’s, malls, and things to keep everyone occupied. The full page color charts are visually attractive and list most of what is located at each and every stop along the way. It is easy to plan your trips around your favorite restaurants, camping sites, motels, and attractions and you can annotate your comments in the journal or on the charts. I highly recommend this book to anyone traveling the I-95 corridor. I intend to use this book when we take our next trip to the Carolinas and Florida. It is an excellent tool for those who like to plan their road trips and take advantage of the many attractions along the way. 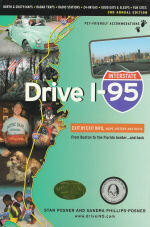 Instead of blindly going south or north on the I-95 corridor "Drive I-95: Exit by Exit Info, Maps, History and Trivia, Third Edition" will keep your eyes wide open to the possibilities along the way.